Dear Customers! 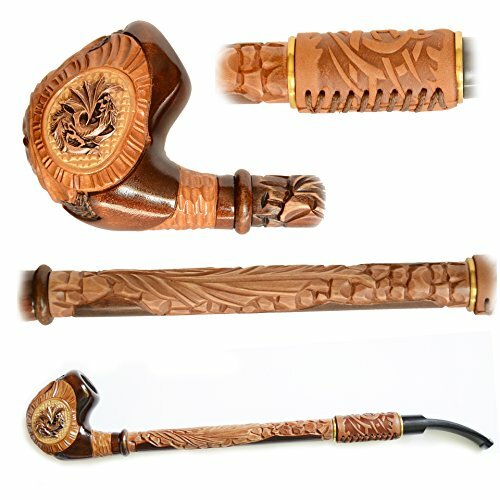 To your attention there is an excellent pipe hand carved with author's signature. Incrustation of this model is unique, amazes with its original fulfillment of bowl, jewelry carving and elegance of design. BRAND NEW NEVER USED! Bowl material - pear tree root; Mouthpiece - pear tree wood and acrylic fits 9mm filter; Length 13.4"/34cm; Height bowl 2.4"/6cm; Diameter bowl inner 0.7"/1.8cm; Depth bowl 1.8"/4.5cm. Please note that color and shape may vary slightly from the picture. Each item is handmade and slight variations may occur. Length 13.4"/34cm; Height of bowl 2.4"/6cm; Diameter of bowl inner 0.7"/1.8cm; Depth of bowl 1.8"/4.5cm. If you have any questions about this product by Ukrainian souvenir, contact us by completing and submitting the form below. If you are looking for a specif part number, please include it with your message.